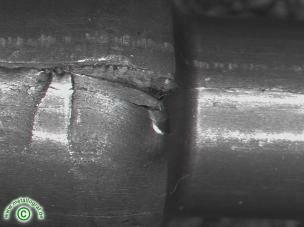 It can come to bursts at the wire surface of cold upsetting steels by the compressing to screws or tools. The strength of the bursts is dependent from the degree of the cold forming, the size of the existing defects and possible anomalies of the structure. A pincher and pre-material defects, with an slag in surface proximity, were the reason for the processing problems in this case.